The project Tim Ballew is referring to in the letter is SSA Marine’s proposed Gateway Pacific Terminal (GPT), a 48 million metric ton per year coal export terminal that would be located at Xwe’chi’eXen (Cherry Point), in Washington state. The letter to the Corps, authorized by the LIBC, was signed by Ballew, and it asked the Corps to immediately deny SSA Marine’s permit application for the proposed GPT at Xwe’chi’eXen (Cherry Point), based on the project’s adverse impacts on the treaty rights of the Lummi Nation. 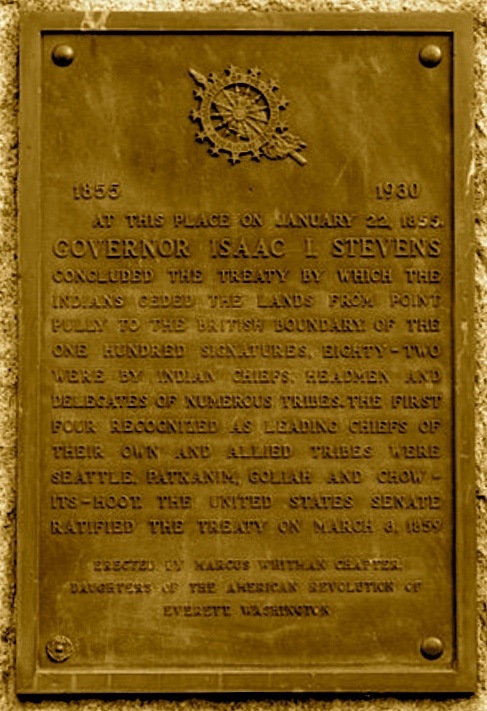 The LIBC letter stated that, “The impacts on the Nation’s treaty rights associated with this project cannot be mitigated.” The Lummi Nation is guaranteed rights under the Treaty of Point Elliott of 1855. In response to news of this letter to the Corps, SSA Marine senior vice president Bob Watters authored an Op-Ed published in The Bellingham Herald on January 10, 2015. While the words “treaty” or “treaty rights” were used nine times in the LIBC’s 2-page cover letter accompanying the 97 page document they sent to the Corps, Bob Watters never used the words “treaty” or “treaty rights” in his Op-Ed. This noticeable omission is illustrative of the fact that SSA Marine, in its endeavor to build and operate the proposed GPT at Xwe’chi’eXen (Cherry Point), continues to minimize and/or ignore the treaty rights of the Lummi Nation and the Nooksack Indian Tribe. Ignoring those treaty rights as if they don’t exist does not cause those treaty rights to disappear. It is easy to question if SSA Marine’s and Bob Watters’ professed “concern about the challenges to Lummi fishers” is fair or sincere when SSA Marine continues to pursue its plan to build and operate GPT. 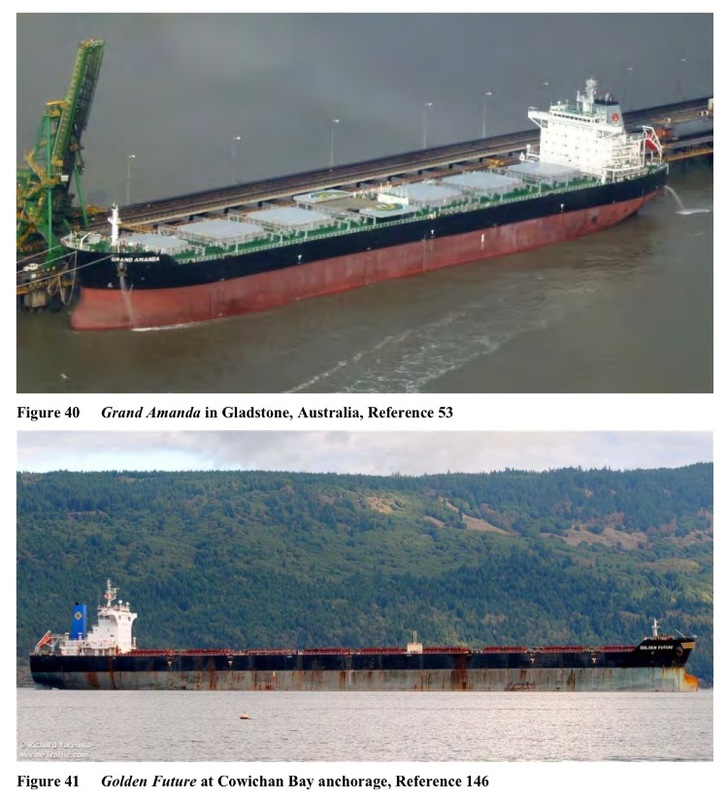 They carry on with their coal export scheme, even though the Lummi Nation has stated consistently, for years, that it is opposed to SSA Marine’s project. Sincere and honest intentions are hard to discern when, even after the Lummi Nation has asked the Corps to deny SSA’s permit application for GPT, citing that the project will cause devastating environmental impacts to the Lummi Nation and will cause unacceptable and unavoidable impacts on the treaty fishing rights of the Lummi Nation, SSA Marine still continues to push forward with plans to build its terminal. Whether or not the proposed site for GPT at Xwe’chi’eXen (Cherry Point) is part of the original Lummi reservation is still in question. 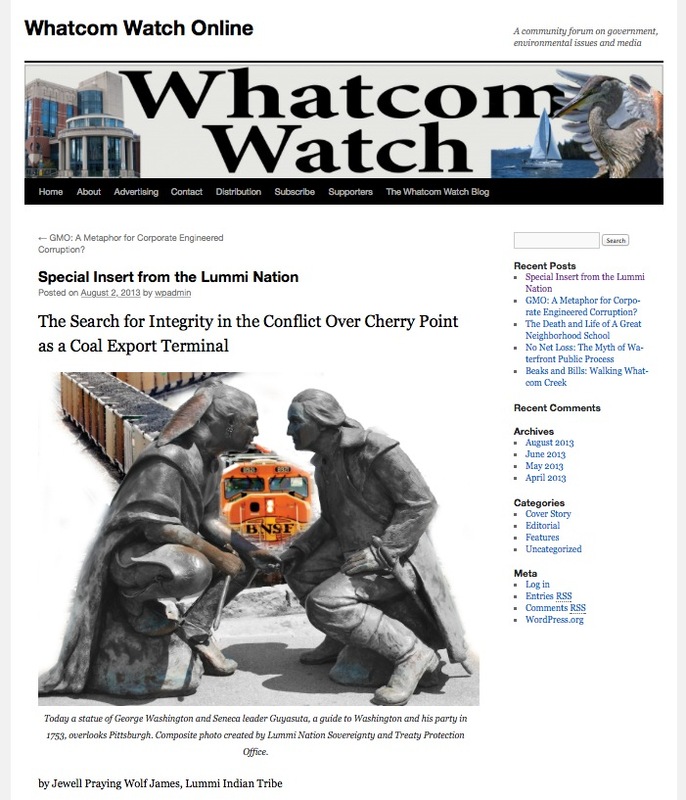 An August 2013 special insert in the Whatcom Watch, “The Search for Integrity In the Conflict Over Cherry Point as a Coal Export Terminal,” written by Jewell Praying Wolf James, offers overview and depth on the history of Xwe’chi’eXen (Cherry Point). 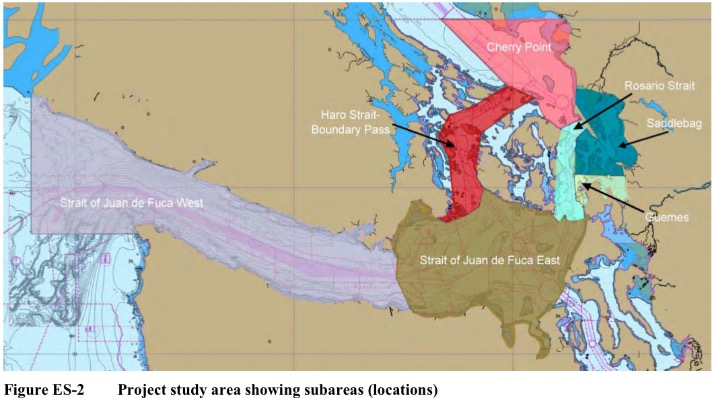 Also, when Watters said that SSA’s property at Xwe’chi’eXen (Cherry Point) is not part of the Lummi reservation, it is important to note this fact: SSA Marine does not own the waterways and tidelands which it would need permission to use for the essential shipping component of its proposed coal export terminal. The negative impacts from 487 Capesize and Panamax vessels which would call on GPT yearly, would conflict with the Lummi Nation’s fishing rights at one or more of its usual and accustomed fishing places under the Treaty of Point Elliott. The recently released “Vessel Traffic and Risk Assessment Study” (VTRAS) provides substantial evidence of some of, but not including all of, the impacts to the Lummi Nation’s treaty fishing rights from the increased vessel traffic that the proposed GPT would bring to the Northern part of the Puget Sound. The VTRAS study was conducted by Glosten and Associates. The study’s Executive Summary explains that the study was required as part of a 1999 settlement agreement stemming from an appeal of the Shoreline Substantial Development permit applied for in 1992 by SSA Marine’s created subsidiary, Pacific International Terminals (PIT). The permit was one of the permits SSA/PIT needed for its proposed GPT shipping terminal at that time, which could have handled and shipped 8.2 million tons of cargoes (coal was not one of those commodities). After that permit was issued by Whatcom County in 1997, several agencies, along with several groups, appealed that permit decision by the county. An agreement was made during the 1999 settlement which required SSA/PIT to perform an analysis, with oversight by the state Department of Ecology, of the additional ship traffic brought by the newly proposed GPT. The Lummi Nation participated in the VTRAS, but it was not a party to the 1999 settlement agreement. Watters’ claim that SSA Marine will protect tribal culture and historical sites, could bring to mind a question: Did SSA/PIT protect tribal culture and historical sites when in July 2011, without obtaining the necessary permits, its engineering contractor AMEC Earth & Environmental, Inc., bulldozed/cleared 9 acres, drilled 19 boreholes (from 80 ft. to 130 ft. deep), performed 19 cone penetration tests (100 ft. deep), destroyed close to 3 acres of wetlands, and illegally filled approximately 1.2 acres of wetlands at the proposed GPT site at Xwe’chi’eXen (Cherry Point)? 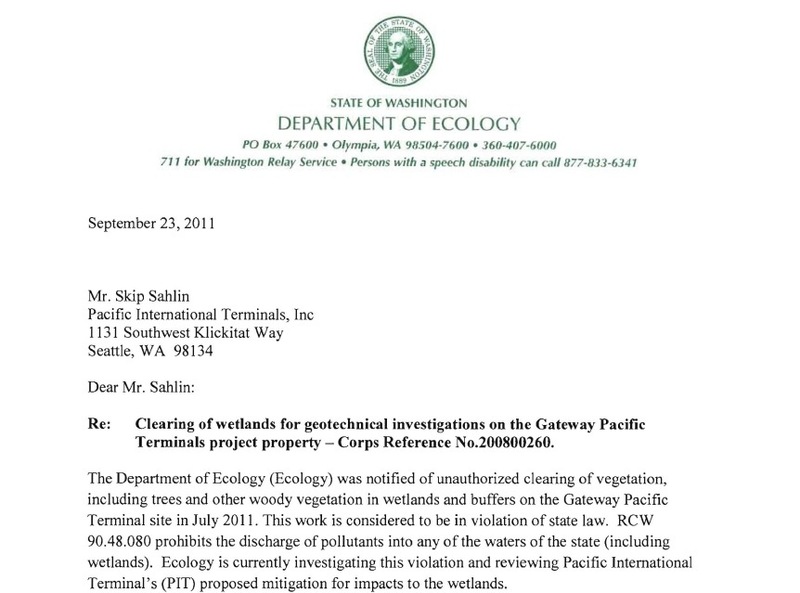 The Washington Department of Ecology said in its September 23, 2011 letter to SSA/PIT that the work done by SSA/PIT was in violation of state law. Additionally, with the unauthorized, illegal drilling and land clearing work SSA/PIT did at that time, the company had ignored a requirement (section 106) of the National Historic Preservation Act, by failing to consult first with Native American tribes (the Lummi and Nooksack), about potential archaeological impacts of that unauthorized land clearing and drilling. In reading the LIBC’s letter to the Corps, it is evident that the best way that SSA and Bob Watters “can work to enhance” the tribes’ cultural prospects, is to immediately withdraw SSA’s permit applications for GPT. In his Op-Ed, Watters referred to a number of polls which he claimed support building and operating GPT. Not only are polls not a definitive representation of how the people in Whatcom County actually feel about GPT, but the polls Watters cited have no relevance to the LIBC’s letter giving reasons for the Lummi Nation’s request that the Corps immediately deny SSA Marine’s permit application. None of the questions in the polls cited by Watters refer to the Lummi Nation and the adverse impacts from the proposed 48 million metric ton per year coal terminal on the Nation’s treaty rights, and on its peoples. The last sentence of that paragraph in Watters’ full statement, differs from the last sentence of the same paragraph in Watters’ Op-Ed in the Herald which read: “Gateway Pacific Terminal’s proposed lease of state tidelands is just .002 of that usual and accustomed area.” The reference to “46 acres” was not included in his Herald Op-Ed. Watters/SSA Marine may have decided not to include the “46 acres” number in the Op-Ed because of the fact that in 1992, the Corps had already rejected the permit application of the proposed salmon farm that would have involved an area of 1.41 acres on the water’s surface, and covering some 11.36 acres of anchorage area. So, pointing out that the proposed GPT project would necessitate leasing an area of 46 acres of state tidelands which is nearly four times larger than the salmon farm permit application which had been denied by the Corps in 1992, surely would not be advantageous to SSA Marine’s position. 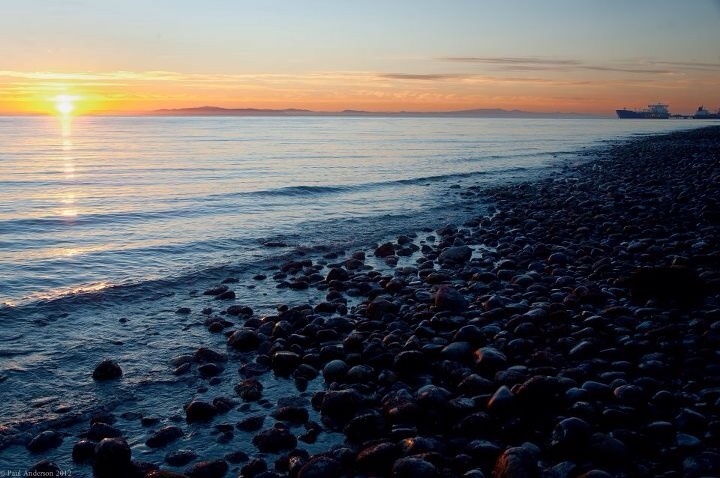 SSA Marine continues to push the GPT project on the Lummi Nation when the Nation has repeatedly stated its steadfast opposition to the project. After the recent LIBC letter requesting that the Corps immediately deny the permit application for GPT, Watters and SSA Marine are worlds away from demonstrating “Good Faith” by launching public challenges which prioritize the necessity for trade and economic development above the duties imposed by the trust obligation owed by the Corps to the Lummi Nation. In the 1980s, when Chicago Bridge and Iron’s proposal to build offshore drilling platforms at Cherry Point was stopped by Washington Environmental Council, the prolific crab fishery there was a major factor. That fishery includes both treaty and non-treaty fleets, as well as seafood processors in Blaine, Fisherman’s Cove and Bellingham.